Since 1910 the Boy Scouts of America have contributed to the moral and physical character of our communities by offering opportunities where young men can experience fun and adventure while learning the skills necessary for good citizenship and leadership. we offer this certificate with no "strings attached" other than you must be an Eagle. Your Eagle Court of Honor observes a very proud tradition that our organization is pleased to recognize in memory of the Grand Army of the Republic (GAR). Comprised of over 400,000 Union Veterans of the American Civil War of 1861-1865, the GAR was a living symbol of patriotism when the Boy Scouts of America was formed in 1910. 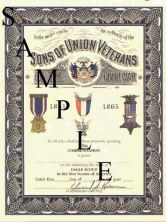 Before the passing of their last member (on August 2, 1956) the GAR officially recognized the Sons of Union Veterans of the Civil War (SUVCW) as their Legal Heir. As such, it is our honor to maintain the many traditions of the GAR. concepts that are "near and dear" to the Boy Scouts of America. When possible, every effort is made by our Camp to present the certificate to the Scout at his Court of Honor. Presentation made by L-R, Bro. Jr. Vicr. Cmdr.-Patriotic Instructor Richard E. Straight and Bro. Commander Leo McGuire. recognize young men from the Capital District in New York who have earned Scouting's highest honor, the rank of Eagle Scout. 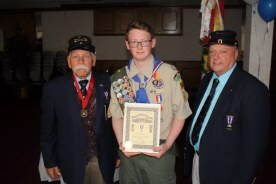 We will present a full-color Eagle Scout certificate to a Scout deemed eligible. 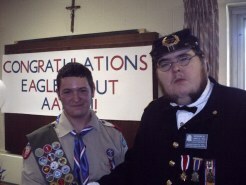 at an Eagle Scout Court of Honor may be arranged. Please click the link below for the application and contact person. Adobe Acrobat Reader is required to open this PDF file. **Important!! In order for you to download the Application, you will need to have Adobe Acrobat Reader installed on your computer. This application maybe filled out online and then printed. We recommend you keep a copy for your records. 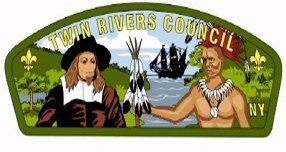 You may also keep an electronic copy by saving the completed form to your computer (you must use a different filename in order to preserve your entries).